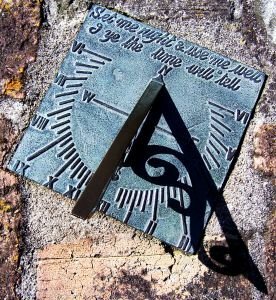 Sundials make an interesting focal point to a garden. Besides being attractive, they actually work and can be a source of entertainment and education for children. The history of them goes back a long way. No doubt the first one was the shadow of a tree as ancient man noticed that the shadow moved during the day. There are many different types and degrees of accuracy that have been developed over the centuries. The most common is the horizontal design shown to the right. Some use a line of light, focused through a slit or other aperture to indicate the time and others use the shadow of an object to indicate the time. Adjustable devices can be very accurate, but most are used today as a decorative piece.